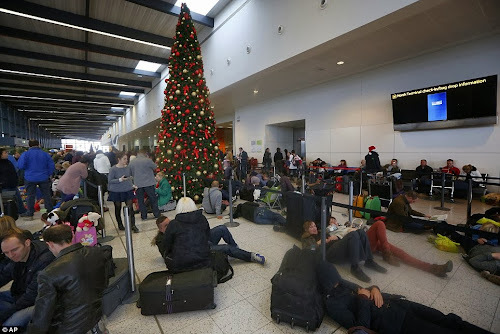 Thousands of passengers were stuck at Gatwick today as they battled to get home for Christmas after 75 flights to and from the airport were cancelled because of power cuts following last night's storm. EasyJet has been forced to cancel 53 flights while British Airways were forced to axe 22 services as a result of the problems at the North Terminal caused by the failure of two substations. In addition, six easyJet flights have been postponed until tomorrow because of the disruption. Both airlines were scrambling to swap passengers onto alternative flights with empty seats in an effort to get as many people as possible to their destination before tomorrow. British Airways were telling passengers at Gatwick their bags may not be put on the plane as a result of the disruption. Separately, 70,000 homes remain without power this afternoon as suppliers face a race against time to restore electricity before tomorrow. However, UK Power Networks said 'thousands' of people will not get supplies back before tomorrow. UKIP leader Nigel Farage may be 'forced' to spend Christmas in the pub after he lost his electricity supply. 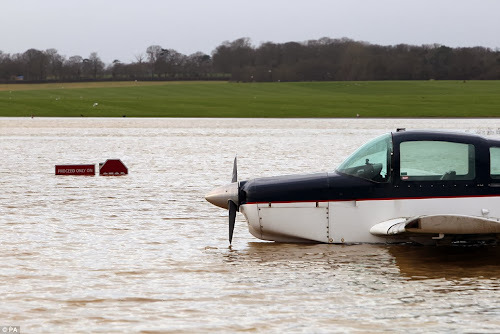 The Met Office said that 30mm to 60 mm of rainfall across southern England over the last 24 hours, and many rivers including the Medway, Severn and Thames are continuing to rise, bringing a risk of flooding over the next three days, according to the Environment Agency. The situation at Gatwick was made worse by the cancellation of Express train services from central London to the airport because of trees falling on the line. There were even problems with toilets being out of order because of the power cuts. Last night 1,500 passengers on 10 easyJet flights to the airport in West Sussex were forced to land at Liverpool's John Lennon Airport and told to make their own way on to their destinations. Another plane heading to Southend was also forced to land in the north-west as the storm battered southern England last night. British Airways said they are allowing passengers to switch their flights to any airport up to 300 miles from their destination. A spokesman for Gatwick Airport said that passengers were facing 'average' delays of around 90 minutes today and dozens of flights had been cancelled. A spokesman for easyJet said they had been forced to cancel 38 flights alone while dozens of others were facing delays. The chaos was compounded by a lack of information and the closure of toilets, coffee shops, restaurants and other facilities due to the power cut, passengers complained. Passengers took to Twitter to complain, first, that there were too few announcements and secondly, that the announcements that were made were inaudible. Graziella Vella, a six-months-pregnant make-up artist from Kilburn in north west London, was due to fly to Malta to spend Christmas with her family. The 37-year-old said: 'I am fuming and absolutely desperate - there has been no information at all and we can't make alternative plans. 'We're just hanging in limbo... at least if they said 'Nothing is going to happen, come back tomorrow', but there is no information of any kind.